After that period in time I had to spent 90% of my fly fishing sessions during the weekend. I had to get to used to the sometimes crowded waters and with the presence of other anglers around, all competing for the best spots. It wasnt an easy switch mentally for me, after my previous solitude mode of (fly) fishing. What it meant for the fishing itself, was that I had to plan better - when to go, where to go and had to try to figure out which anglers are least capable to catch fish on certain spots with their methods used - live bait, spin, fly etc. It was hard to fish after some of the best live worm fishers on my local trout rivers, but after some time I started to catch my fair share of good local trouts, even on the crowded waters. I didn't have the luxury to have all the best spots to myself anymore, so I had to learn to fish smarter. Planning was a major part of it, as it can be, even when there is no one around to compete for fish and spots. The best working approach was hit and run - to fish fast the best water and to keep moving forward, covering more water than everyone else on the stream. It may sound more like of a military operation execution, than like of a relaxed day of enjoying the outdoors, but it works. Sometimes things were hard-going and the best way was to sharpen my concentration by thinking that if I didn't catch anything today, I will die from starvation, so now my live depends on catching fish! That too may sound crazy, I know, but it worked well for my concentration - we don't have many trout over here, so sometimes you have to give your best efforts to catch any at all! I know some prefer to start "thinking" like a fish, to find out what a fish will do, which may help too, but I would rather prefer to start acting like a predator! The ultimate predator doesn't show emotions. Trembling hands and overexcitement, when a big trout is seen, may interfere in a bad way with the efficiency catching the fish. I've blown my chances with a few good fish in the past, just being overexcited, acting in a hurry, instead of using a more cold-blooded accessment of the situation and figuring out the best fishing-wise approach to it. It's hard to stay cool, I know we are humans after all and we may never learn to fish like a heron, but it certainly helps if we can get even close to that! I may get a bit excited when I know the fishing conditions are right, the weather, the water levels etc. are all pointing to a good fishing day, but as soon as Im ready for my first cast I will forget all that excitement and concentrate on the task. And as I said before - a fishing day begins long before reaching the water, it begins with a Plan - where, when and how to fish. 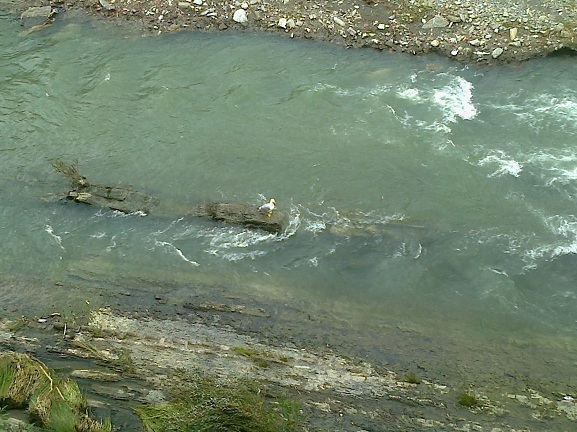 Some 300+km from the sea I was watching a sea bird hunting to survive on small fish in the small trout stream below my hotel room balcony. The bird stay calm for 15 minutes, maybe more, before launching efficiently on the first attack. And then again and again the same pattern will repeat. To be efficient in the nature and survive, this is how it is - with no emotions! Are you trembling when you approach a big fish, in front of you or are you like a cold-blooded, ultimate predator?